We are living at a time when the distinction between the domestic and foreign realms of politics has not merely blurred, but has abolished altogether. While Turkish Prime Minister Recep Tayyip Erdogan’s harsh critique of Israel on its existential Palestinian issue on a global platform led to an immediate rise in the domestic support base of Erdogan’s ruling Justice and Development Party (AK Party), Turkey’s explicit support for the oppositional groups in the ongoing Syrian civil war has sparked an intensification in attacks by the Kurdistan Workers’ Party (PKK) within Turkey. No other political actor can be more aware of this direct correlation between domestic and foreign realms of politics than the AK Party, which legitimizes its domestic political power through a foreign policy discourse of “Turkey as a rising global power”. In other words, this new foreign policy discourse — whether realistic or not — serves to legitimize the domestic power of the ruling party. As Yüksel Taskın wrote in 2011, the opposition parties are yet to grasp this overlap between Turkey’s domestic and foreign policy spheres, and have thus far failed to present any alternative foreign policy discourse. It seems that the main opposition, the Republican People’s Party (CHP), only recently noticed the organic linkage between the AK Party’s domestic and foreign policies, and started to try to develop its own discourse on Turkey’s stance on the Syrian civil war. Still, the alternative discourse it proposes (based on the aphorism “peace at home, peace in the world”, coined by Turkey’s founder, Mustafa Kemal Atatürk) remains mere repetition of Turkey’s traditional foreign policy stance, one that in general stayed pro-status quo and one (Western) dimensional during the Cold War era. Whether this discursive repetition will ultimately be designated impotence or prudence will be the direct result of the success or failure of the AK Party’s foreign policy discourse. Aiming to foresee the outcome of this discourse, the recently published “Another Empire? A Decade of Turkey’s Foreign Policy under the Justice and Development Party” analyzes from various angles the decade of Turkey’s foreign policy under the leadership of the AK Party, 2002 to 2012. To predict the outcome of this currently hegemonic discourse is to attempt to grasp its meaning — i.e. its promise and limitations — for Turkey’s future; it is indispensable for the contextualization of the discourse of Turkey as a rising global power. At the most basic level of analysis, this is clearly a post-Cold War discourse. Turkey was a firm and strategically vital ally of the Western bloc in the Cold War. Despite sporadic crises with the US and her neighboring allies, like those with Greece on the Cyprus issue, the ruling bureaucratic elite authoritatively defined the “national interests” of Turkey as lying exclusively to the West, and in the continuation of the present status quo in her region. In practice this policy meant an alliance with the authoritative regimes of the Middle East, as in the case of Baghdad Pact through which Iran, Iraq and Turkey took a united stance on their common Kurdish problem. Therefore, Turkey, next to Israel, became the representative of Western interests in the region to such an extent that between 1950 and ’60, Ankara without hesitation sided with the colonial powers at several sessions of the UN General Assembly on the right to self-determination of North African countries, even as neighbor Greece supported the non-aligned countries of Africa and Asia. Now, as the end of the Cold War has provided Turkey with the ability and space to maneuver, and the geo-strategic reasons to diversify her interests without giving up her Western orientation, the AK Party’s period in power represents the climax of a new, active and multi-dimensional period in foreign policy. The deadlock in Turkey’s European Union membership has, therefore, mitigated by her active presence in all her neighboring regions, from North Africa and the Middle East to the Caucasus and Eastern Europe. In stark contrast to the preceding ages, Turkey overtly supported the Arab revolutions that destroyed authoritarian regimes, several of which were Western allies in the Middle East. The second level of analysis relates to the agency of Turkish foreign policy. In the preceding decades, Turkish foreign policy was determined by the traditional Kemalist civil and military bureaucratic elite in such a manner that it had become the true national taboo, sacred and above political debate. As Kerem Öktem argues in “Another Empire”, this domain is now populated by a multitude of actors, ranging from nongovernmental organizations (such as the Association of Researchers on the Middle East and Africa, ORDAF) and religious networks (such as the Fethullah Gülen / Hizmet Movement) to governmental bodies (such as the Turkish Cooperation and Development Agency, TIKA). This process of de-militarization of decision making mechanisms and of diversification of the state elite is not, however, equivalent to the total dissolution of the traditional Kemalist elite. In her recent study, “Between Islam and the State: The Politics of Engagement”, Berna Turam justly argued that the distinctive feature of moderate political Islam –i.e. the Hizmet Movement and the AK Party — is its ability to transcend the conflictual attitude of the previous Islamist actors towards the state structure, together with its will and capability to employ a non-confrontational, but mutually transformative relationship with the Kemalist civil and military bureaucratic elite. In his recent study, “Passive Revolution: Absorbing the Islamic Challenge to Capitalism”, Cihan Tugal — by questioning the contradictory coexistence of the destructive results of neo-liberal polices for society with mass demobilization and passivity — brilliantly argued the absorption of radicalism led by the ruling AK Party, in addition to the Hizmet Movement, serves historically the reconstitution of capitalist hegemony. Tugal reads the AK Party’s political power as a passive revolution; a new hegemonic project through which the political and social challenges to the system are absorbed. Now, whether or not this hegemonic project could be interpreted as successful in the solution of the Islamic challenge by turning itself into a global model of the compatibility of Islam, democracy and capitalism, it has failed in the demobilization of Kurdish unrest. This failure becomes all the more blatant as the discourse of the ruling party turns from a religiously blended civilization discourse to one of “single nation, single country, single state, single flag”. Moreover, this domestic failure has become an international one, as Turkey’s support for the Free Syrian Army (FSA) has led not only to an immense increase in attacks by the PKK, but also to a de facto Kurdish autonomous territory in norther Syria, similar to that in Northern Iraq. The boomerang effect — the relationship between the domestic and foreign policies of Turkey — that has thus far worked in favor of AK Party’s political power has begun to undermine it. There stands serious challenges, therefore, to the realization of the discourse of Turkey as a rising global power. Without doubt, Turkey has emerged as a pivotal regional power thanks to the rise of her economy and her middle classes, and to her proactive, multifaceted and dynamic foreign policy. The decision to get involved in any crisis in her region as a mediating power — particularly when the present catastrophic state of the Middle East is taken into account — can be read, by itself, a true achievement. As Baskın Oran argues in the preface to “Another Empire?”, this proactive foreign policy can be interpreted neither as a change of axis nor as a new kind of Ottomanism. The relative autonomy that Turkey is trying to acquire in the international arena naturally necessitates a certain kind of deviation from Western interests, as the present tension between Turkey and Israel illustrates, and a historical reference to the Ottoman past remains merely discursive. Indeed, the main problem relates to the discourse of a “Turkish model”. The question is not only whether Turkey’s soft power is adequate or international dynamics suitable for the accomplishment of the goal of being a regional medium power, but most importantly whether Turkey can become a model for the compatibility of Islam, democracy and capitalism in the region; in Oran’s words, with all those “historical hunches” on her back. “Another Empire”, in this respect, can be read as an attempt to address this vital question through analysis of the last decade of Turkey’s foreign policy under the AK Party from a variety of angles and conceptualizations. Reference: Özcan, Ahmet (2013). “Turkey as a Rising Power Put to the Test”, Turkish Review, Vol. 3/1, February, pp. 97-100. Yüksel Taskın, “Yükselen Küresel Güç Türkiye Söyleminin Islevleri” (“The Functions of the Discourse of Turkey as a Rising Global Power”), Radikal, October 25, 2011, p. 21. Baskın Oran (ed. ), Türk Dıs Politikası (Turkish Foreign Policy), Istanbul: Iletisim Yay., Vol. 1, 2003, pp. 634 – 635. Kerem Öktem, “Projecting Power: Non-Conventional Policy Actors in Turkey’s International Relations”, in Kerem Öktem, Ayse Kadıoglu, and Mehmet Karlı (eds. 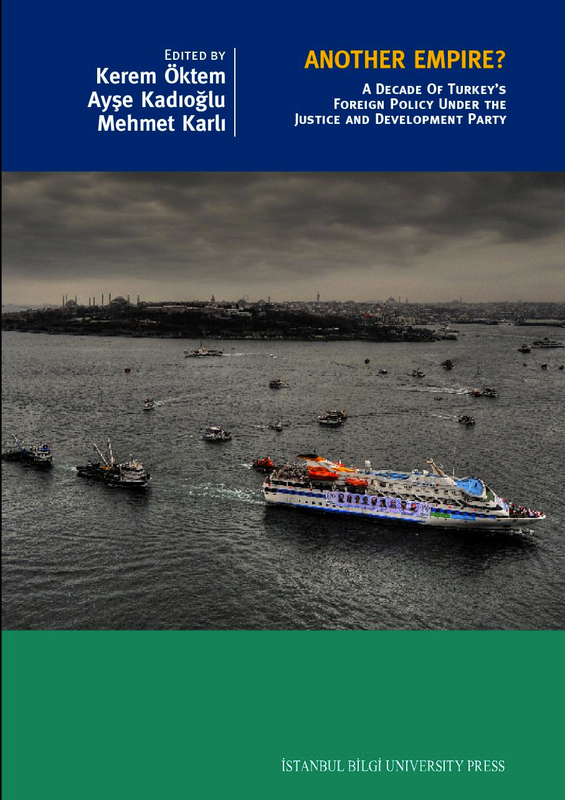 ), Another Empire: A Decade of Turkey’s Foreign Policy under the Justice and Development Party, Istanbul: Istanbul Bilgi University Press, 2012, pp. 77 – 108. See: Berna Turam, Between Islam and the State: The Politics of Engagement, California: Stanford University Press, 2007. See: Cihan Tugal, Passive Revolution: Absorbing the Islamic Challenge to Capitalism, California: Stanford University Press, 2009. Kerem Öktem and Ayse Kadıoglu, “Introduction”, in Öktem et al. (eds. ), p. 1. Baskın Oran, “A Proactive Policy with Many Hunches on the Back”, in Öktem et al. (eds. ), pp. xv – xxiii.